Welcome to Wisconsin Dells Indoor Water Parks. 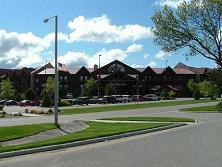 The Dells is an enormously popular year round attraction for family vacationers and a “unique vacation destination" for kids and adults of all ages. 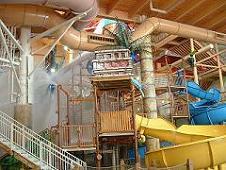 Whether it’s winter or summer, there are several world class indoor water parks in the Wisconsin Dells to choose from! Enjoy the warm summer weather by spending a sunny day with your family at the world's largest outdoor water park, or beat the snow and cold weather and enjoy a weekend getaway at America's largest indoor water park. The African safari theme park experience is right here in the Wisconsin Dells. 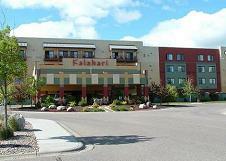 The Kalahari Resort offers what they say is the largest indoor water park. The Kalahari Resort indoor water park boasts virtually every attraction found at a large outdoor water park. When you first walk in, the scope and size is almost overwhelming. For information and pictures about the specific water rides click on this link to Kalahari Resort. The boys insisted on trying their luck at surfing the famous Waverider. It is very challenging and they had a lot of practice runs ending up on their behinds! But they and many others sure had a lot of fun trying. We took a break and relaxed on a tube down the Lazy River, where we could stop and start when and wherever we wanted. The Wave Pool was a lot of fun as the waves are close to like being at the ocean. They also had several good size whirlpools in this area. Also, in the indoor water park area, several concessions are available such as Zulu Grille, Cracked Coconut, and the Mud Hut which serves kids and adult beverages inside the middle of the water park while overlooking the fun. Overall, we were very impressed with the water park, especially the dedicated lifeguards on duty. It was also nice to see an extensive kids play area and a 0 depth pool for the very young. The water park is open to the public as well when purchasing an all day pass. You do not have to stay in the resort to experience the fun. A definite advantage for the Great Wolf is that the indoor water park was not open to the public and was for hotel guests only. The water park was not crowded when we went, which meant we wouldn’t be standing in any lines. The water park was enormous. It featured over 70,000 square feet of water park fun, including countless number of water slides, pools, a lazy river, whirlpools, and more. 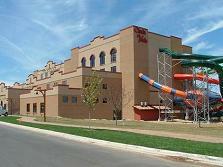 The Chula Vista Resort has opened a huge brand new year round Wisconsin Dells indoor water parks. This is an 80,000 square foot, multi-level, multi-slide, multi-massive indoor water park. The new Lost Rios has 13 waterslides, the world’s longest and fastest indoor zip Fly’n Mayan Water Coaster, several adult and kiddie pool areas that include a lazy river, family raft rides, speed slides, Mount Montezuma Rainforest & Tipping Bucket, a swimming pool, whirlpool and much more. Adjacent to the Wisconsin Dells indoor water parks is a huge Lost City of Gold Arcade. The arcade includes several game opportunities which can reward you with prizes. Food and drink are available for all at Sangria Maria‘s Tiki Bar, and Crash Landings Bar & Grill. The Wilderness now has three distinct Wisconsin Dells indoor water parks with over 200,000 square feet. New to the Wilderness Resort is the Wild Waterdome. It has an awesome wave pool named theThe Great Wave. I personally road the waves several times with and without a tube. For indoors it is really amazing. Beth and I also road the water slide called the Mammoth a few times. It is a very large tube that seats four, and gives you quite a ride. They have several private cabanas for rent and two eating areas called Tommy Knockers and Survivors Bar and Grill. The part we liked the best about this Wisconsin Dells indoor water parks was the wide open space in the dome. It has more of a beach feel with lounge chairs. Bring your sunglasses and suntan oil. The Dome is a new hi-tech glass that allows you to suntan all year round. 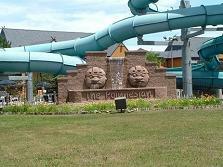 The Wild West Water Park, has over 70,000 square feet of fun! One of our favorites rides was the Fantastic Voyage, which is a five stories high family raft ride. There is also a lot of fun to be had at the Cannonball, and several other tube slides. This also has a smaller wave pool, and has a huge play area for the kids with a Wild West Bucket Dump. If your hungry or thirsty check out the Thirsty Buffalo and Grizzly‘s Grill. has 65,000 square feet of hands on activities including, body slides, lazy river and much more. 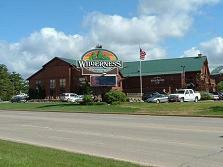 This was the main water park the first time we visited the Wilderness Resort Wisconsin Dells indoor water parks. We came with the entire family including Grandparents who enjoyed watching all the grandchildren ages, 2-20, race around the attractions. Our children were the three oldest grandchildren, so they set off with friends and cousins, while we retreated to the hot tub that was built partially inside and partially outside of the building. There is nothing more romantic than to sit in a hot tub watching and feeling the beautiful Wisconsin snowflakes fall around you. They have several good tube slides but the big boys go the best action from the Hurricane. Kid and family foods are available to eat at the Klondike Kanteen. The indoor water park at the Polynesian Resort has over 38,000 square foot of water excitement. The boys had a great time in the Aloha Pavilion playing water basketball, and spent time on the rides like the Temple of the Black Pearl. Another indoor play area, features two 2-story waterslides, Blackbeard's Dark Tunnel Mystery Voyage Lazy River, the Water Factory, and two whirlpools. One of the favorites that keep kids coming back is the bucket of water…you guessed it - a full bucket of water is dumped on everyone down below! If you’re looking for a smaller, more contained resort, then the Polynesian is your ticket. The indoor water park at Mt Olympus, Medusa’s, has 55,000 square feet of water fun for all ages! Some of the water attractions include, Warriors Water Walk, a lazy river, water canyons, geysers, 9 water slides, a wave pool, waterfalls and an awesome children’s pool. The water park has a Mayan jungle theme filled with native artwork and many stone sculptures. Also, it is said that there is 1,500 feet of waterslides in the complex, enough to make anyone happy. Medusa’s is also connected to Treasure Island, now known as Hotel Rome, which is as convenient as you can get for resort guests. This place is so huge you have to check it out for yourself. The park is open 10 am - 10 pm, and is open year round. Medusa’s is paired together with The Parthenon Indoor Theme Park, allowing you to either get wet or stay dry, which is definitely nice.